MIM:In an update to his article "Is CAIR A Terrorist Group?" Dr. Daniel Pipes has this to say regarding CAIR's press release stating that the US Government will help them overturn the UAE's terrorist designation. "Dec. 22, 2014 update: CAIR issued a press release today, "U.S. Government Pledges to Work with CAIR, MAS on UAE Designation" that recounts a meeting of CAIR representatives "with senior U.S. government officials" and reports that "the U.S. government pledged to work together [with the two organizations] to achieve a positive solution to the UAE designations." My take? Over five weeks have gone by since the designation was made public on Nov. 15 and the UAE authorities have been adamant about it, making me skeptical that it will be reversed, even with some help from the Obama administration." MIM: The CAIR press release. (WASHINGTON, D.C., 12/22/14) –- The Council on American-Islamic Relations (CAIR) said today that its representatives met with U.S. government officials about a recent move by the United Arab Emirates (UAE) to add CAIR and the Muslim American Society (MAS) to its list of "terrorist" groups. "The Council on American-Islamic Relations (CAIR) and the Muslim American Society (MAS) met with senior U.S. government officials regarding the United Arab Emirates' (UAE) recent inclusion of the two legally-operating organizations on a list of groups it considers to be terrorist entities. The two American Muslim organizations and the U.S. government pledged to work together to achieve a positive solution to the UAE designations. "A State Department spokesman rejected the designations two days after the list was issued and affirmed that department officials meet regularly with representatives of CAIR and MAS." State Department officials met with leaders of the Hamas-linked Council on American Islamic Relations (CAIR) to discuss the group's inclusion on list of terror groups issued by the United Arab Emirates (UAE), a CAIR news release issued Monday said. The UAE listed CAIR and the Muslim American Society (MAS) among 80 Islamist groups worldwide it linked to terror last month. The State Department questioned the designation, saying it wanted "more information from the Emirati authorities" justifying the designation, with a spokesman adding that "the U.S. does not consider them to be terrorist organizations." According to CAIR's news release, the State Department renewed its pledge to try to get the two Islamist groups removed from the UAE terror list. It's an example of one branch of government treating CAIR as an innocent, legitimate organization while law enforcement, backed by investigative material, takes a more skeptical view. The FBI broke off official contact with CAIR in 2008 after records seized during a terror-financing investigation placed CAIR in a network of U.S.-based organizations supporting Hamas. Government evidence in the prosecution against the Texas-based Holy Land Foundation creates "at least a prima facie (face value) case as to CAIR's involvement in a conspiracy to support Hamas," wrote U.S. District Court Judge Jorge Solis. Meanwhile, at the same time it fights a Muslim nation's terrorist designation, CAIR officials continue to go to bat for convicted terrorists and their enablers. 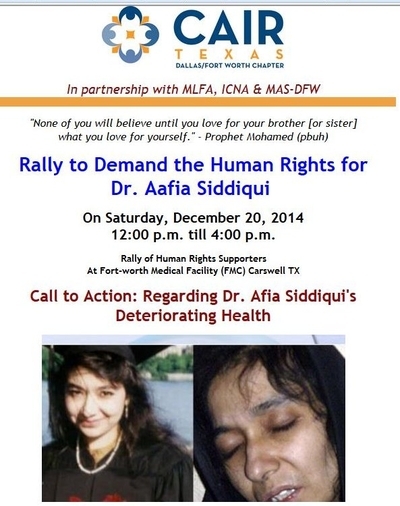 Officials from CAIR's Dallas office helped organize a protest last Saturday lamenting convicted Al-Qaida operative Aafia Siddiqui's conditions . CAIR was joined by MAS and the Islamic Circle of North America to stand up for Siddiqui, also known as "lady al-Qaida." Shortly after her conviction for trying to kill two FBI agents, al-Qaida leader Ayman al-Zawahiri vowed to exact vengeance on her captives. Last summer, Islamic State terrorists mentioned her as part of a proposed prisoner exchange to spare the life of American journalist James Foley, who later was beheaded. MAS, meanwhile, has its own lengthy record of defending accused terrorists and terror supporters. It was formed as the Muslim Brotherhood's overt arm in the United States. Co-founder Abdurrahman Alamoudi, who pleaded guilty in 2004 to engaging in illegal transactions with Libya and facilitating a Libyan plot to assassinate then-Saudi Crown Prince Abdullah, testified in 2012 that MAS's connection with the Brotherhood cannot be disputed. UAE officials have been adverse to the Brotherhood at least since 2013 when they accused the Islamist group of attempting to subvert its national security. The radicalizing of the woman who became 'Lady Al Qaeda': How Aafia Siddiqui arrived in Boston as a biology major at MIT and left as an active jihadi.